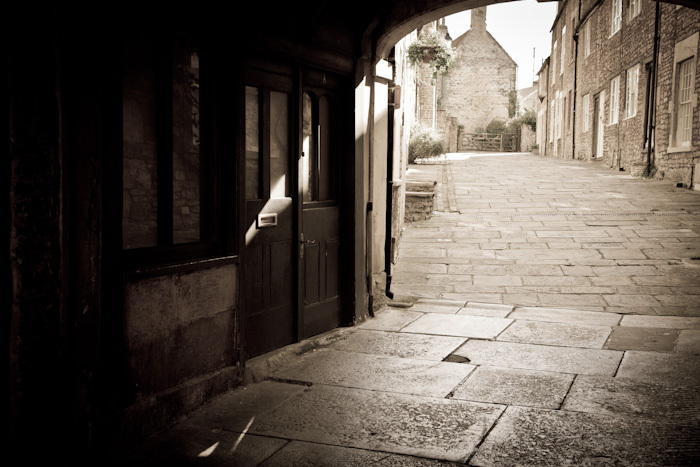 I treated myself to an afternoon photographing Frome. Its sloping, winding streets create myriad possibilities for a photographer interested in architecture. But, putting photography to one side for a moment, it was an interesting place just to spend time in. Key to this was the number of independent shops. So many places are overrun and homogenised by the same old corporate outlets. One of the great pleasures of pottering around a town centre used to be the fascinating variety of things there were to see; the results of the individual creativity of shop owners, all doing their best to entice you in with their inventive displays. Frome still has this. Best of all, I stumbled on a record shop of the old style; the type that existed before they were driven to near-extinction by chain stores and supermarkets, skimming the cream from the market by knocking out a limited range of the best-selling CDs, next to the faux authentic in-store bakery. Not only was the shop packed front-to-back and floor-to-ceiling with every kind of music you could think of, there was a pile of Northern Soul singles left casually on the counter. As a life-long Northern Soul fiend, I felt immediately at home. Back on the streets shortly afterwards, I saw a poster advertising an upcoming Northern Soul night in the town. It was turning into a very worthwhile day. But back to the photography: I managed to shoot what would have been a couple of rolls of film, back in the days when we measured photoshoots in such terms. And it wasn’t just the shopping areas that held attraction. Some of the alleys, archways and backstreets had a photogenic appeal too. And I wasn’t the only photographer about, either, which seemed to confirm my view of the place. I saw at least 3 others, who, judging by their cameras, were more than just casual snappers. So, I guess it was a case of: when in Frome, do as the Fromans do. Argh!